According to Hindu religion, Goddess Durga is the incarnation on goddess Shakti. In Sanskrit language, the Durga means “the one who is unbeatable and can not be defeated by anyone”. Goddess Durga is also called with other name “Mahishasurmardini” because she has killed the buffalo demon named Mahishasur. People worship goddess Durga to get strength, courage and power. During worship of Maa Durga, chanting mantras has special significance. 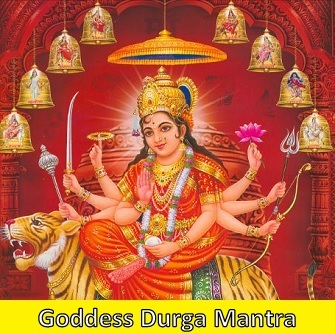 Few Mantras of goddess Durga are written below for different reasons/problems and benefits.